Well, well, well, look who it is. It’s me! That’s right; the wedding’s done and dusted and I have a new name (it has an additional syllable – v annoying), but my love for beer will never be done! Or dusted! Yes, it’s back to reality and, as my reality is drinking an awful lot of beer and writing about it, I’m chuffed to be back. 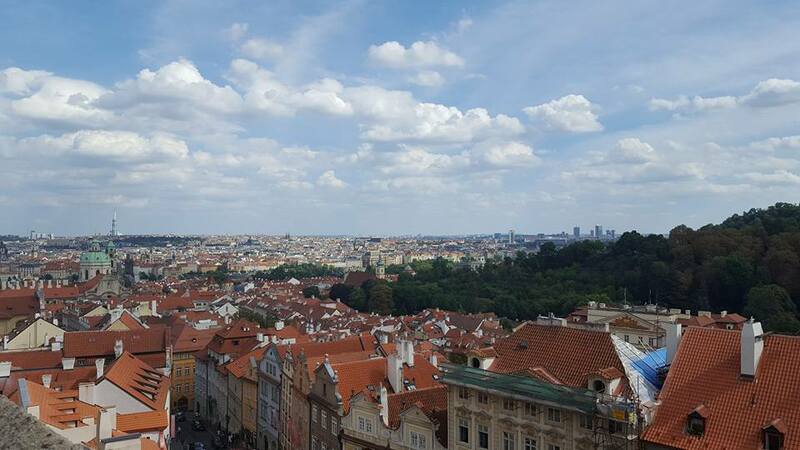 I will only refer to the wedding twice on the blog from here on in: once in this post, as we went to Prague on our honeymoon, and once in another as I talk about the wonderful beer filled location in which we actually got married. But enough of that, let’s get on to the good stuff. I’ve written about Prague before on Crafty Beeress. It’s a place I adore; not just for the beer, but boy does it have a lot of beer and a lot of awesome beer at that. In this post I’ll be recommending a few places to visit, but there are so many pubs, bars and microbreweries opening all the time that it’s definitely worth doing your research before heading over. Still, there’s nothing like the excitement of stumbling across something, is there? Here are some of my stumbles. 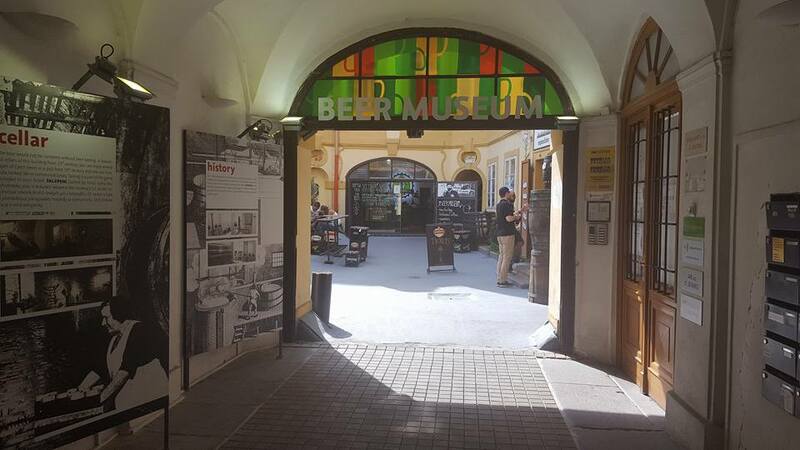 Not to be confused with Prague Beer Museum (also well worth a visit), the Beer Museum is tucked away in the Old Town and, to be honest, more of an exhibition than a museum. 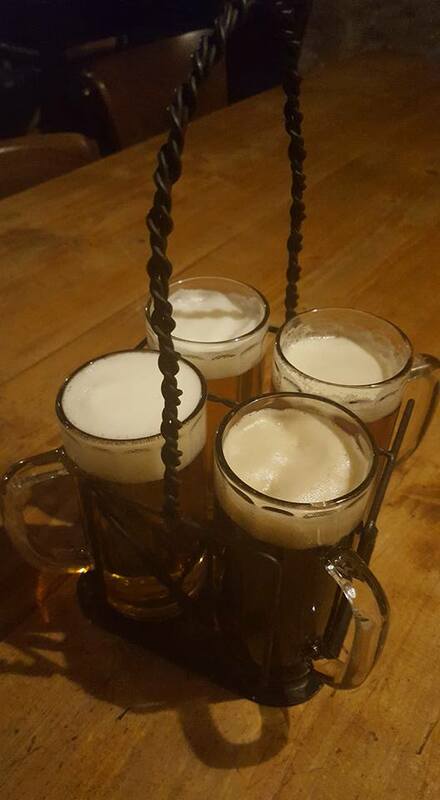 For 280czk each (approx £9.50 in the current climate) you can access the exhibition, learn a bit about the brewing process and the history of beer in Czech, and then head down for a taster of their beers; four, in fact, and they come in this lovely little carrier. Not an absolute must see, but the exhibition was good and the beers were great. I particularly enjoyed the different bars they had downstairs reflecting different periods of time (spoiler alert: Communists weren’t great when it came to designing pubs). 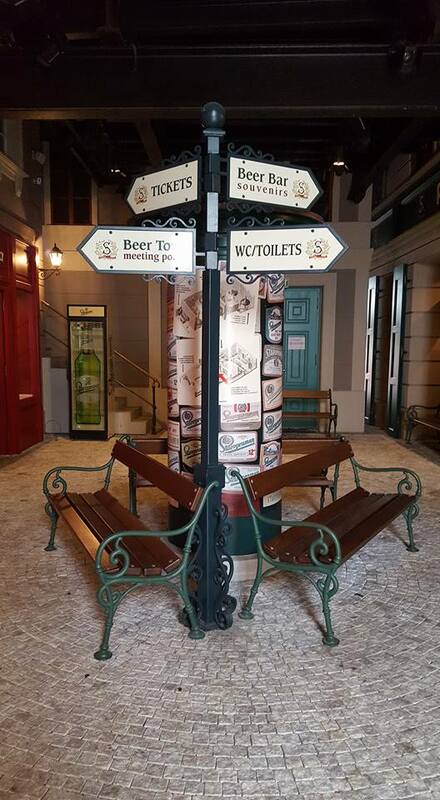 The Beer Museum also has different packages where you can go in to the museum and then bottle your own beer, so do have a look at the website before you go. The Beer Museum, Husova 7, Praha 1. U Tří růží, or The Three Roses, is a brewery and restaurant with two locations, although my favourite is in the old town, near Charles bridge. The interior is small and plain, but comfortable, and the huge tanks behind the bar are a wonderful feature. As you might expect, they only serve their own beer and, due to the size of the brewery, that’s usually a selection of around 6. My stand out this time was the Monastic Beer of St Giles No.4 (try saying that after 3 of them), a semi-dark bock which was sweet and malty, reminiscent of a Belgian blonde. At 7.2% I took my time, but fortunately this is the sort of place in which you can spend a lot of time. Despite being in the centre of Prague’s old town, U Kunstatu is easily missed, but if you do manage to find it you’re in for a treat. They have a menu with well over 50 beers (all from Bohemian and Moravian small to mid size breweries), in every style, and a few taps too. The staff are knowledgeable and love talking about beer, so do ask them for a recommendation. The building itself dates from the 12th century and is the second oldest building in the old town. Make sure you pop down to the ‘secret’ basement; very cool. U Kunstatu, Retezova 3, Praha 1. On our last trip to Prague we went to Pilsner Urquell and this time wanted to check out Krusovice. It turns out Krusovice is a bit of a ball ache to get to and no one does organised tours (gap in the market, anyone?) so we decided to seek out Staropramen instead. To be honest, it’s a bit of a mixed bag. The tour costs around a tenner and for that you get a ‘self guided’ tour and a ‘free’ beer at the end. Essentially you go from room to room and a man who is, apparently, the founder of Staropramen pops up on a screen and gives you hilarious anecdotes about how delicious Staropramen is. I’m not sure we learned very much, but it was actually pretty fun. The highlight was the tap room, which was a comfortable place to sit and relax and, while the beers weren’t outstanding, it was nice to try the different styles that we don’t get in the UK. Don’t go out of your way, but if you have a few hours spare it might be worth popping down. Oh, and make sure you find out when the English tour is (unless you also speak German)! Staropramen Brewery Visitor Centre, Pivovarska 9, Prague 5. I’ve written about Strahov before, and this is quite a claim, but…it’s the best beer in Prague. I know I know, I’m sure some of you will have had differing experiences, but for me I’ve not found another brewery in Prague that produces such pure, fresh, delicious beer. And it’s every style that stands out, from the dark lager to the seasonal red ale and the more experimental IPA. Another thing it has going for it is that the monastery sits atop the hill giving you stunning panoramic views as you sup your beer. Oh, and the goulash is superb. A must on any beer tour. Strahov Monastic Brewery, Nadvori 301, Praha 1.